Kamikaze Beatz Video - Music In the mist of all of this, Reginald realized, something was still missing. So, he started to put his focus back on music. In doing so, he found the missing piece of his puzzle, "MUSIC"! 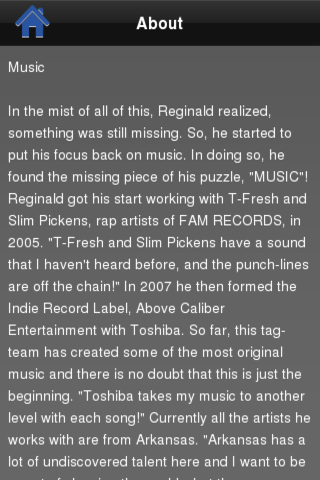 Reginald got his start working with T-Fresh and Slim Pickens, rap artists of FAM RECORDS, in 2005. "T-Fresh and Slim Pickens have a sound that I haven't heard before, and the punch-lines are off the chain!" In 2007 he then formed the Indie Record Label, Above Caliber Entertainment with Toshiba. So far, this tag-team has created some of the most original music and there is no doubt that this is just the beginning. "Toshiba takes my music to another level with each song!" Currently all the artists he works with are from Arkansas. "Arkansas has a lot of undiscovered talent here and I want to be a part of showing the world what they are missing out on!" Reginald “Kamikaze” now specializes in writing and producing R&B, Rap, Hip-Hop, and Alternative.